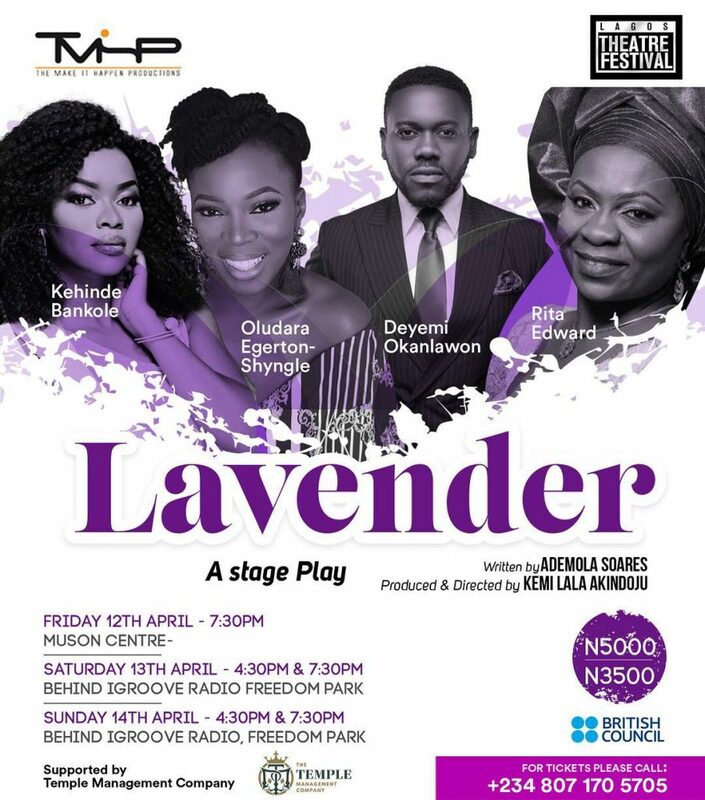 Kemi ‘Lala’ Akindoju’s directorial debut stage drama, Lavender starts today, 12 April, 2019 at the Lagos Theatre Festival 2019, featuring captivating performances from Kehinde Bankole, Deyemi Okanlawon, Rita Edward and Oludara Egerton-Shyngle. Written by Ademola Soares, and produced and directed by Lala, the drama enlightens the audience on surrogacy – exploring the relationship between a young woman and her older best friend who is unable to have children. The 4-man stage play is presented by The Make It Happen Productions which is owned and run by Lala. As Lala’s directorial debut, Lavender represents another ground-breaking project from the award-winning producer known for brilliant plays such as ’The V Monologues’ and her critically acclaimed one-woman show ‘Naked’. She also has credits as associate producer on Ndani TV’s ‘Gidi Up,’ co-producer on Akin Omotoso’s ‘The Ghost and the House of Truth’ and Ishaya Bako’s new film, ‘4th Republic’. Lavender will show three times during the festival, commencing with a command performance today at the Muson Centre, Onikan, followed by two performances each on Saturday 13 April and Sunday, 14 April, 2019 at Freedom Park, Lagos. For purchase of ticket, visit rave.flutterwave.com/pay/lavendertheplay.